"Benefitting the Luke Warner Family"
"Benefitting the Jake Ringering Family"
Please also ensure you get permission to use the GFPD or Local 1692 logo. Please also know that GFPD members are not directly soliciting for donations. We would like to thank the community for all of the support and support of the Warner and Ringering families. Welcome to the Godfrey Fire Protection District Website. We hope that you find the site informative and enjoyable. GFPD, a separate body of government from the Village of Godfrey, is an ISO class 3/3x combination department employing 18 full time and 12 paid-on-call staff. The district proudly protects 36 square miles and 18,000 people. We operate out of two stations and have a variety of apparatus to provide first class fire protection and emergency medical services. Thank you for visiting our website and please do not hesitate to visit us in person. You! Yes you, the citizen, are the first link in the cardiac arrest chain of survival. If you recognize a sudden cardiac arrest, call 911 and immediately start hands-only CPR. You are providing your friend, loved one, or fellow citizen, the best chance at survival from sudden cardiac arrest. Please learn more right here (link)! 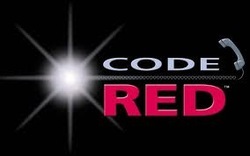 Madison County uses CODE RED (link), a high speed emergency communication service. This system can notify residents and business owners of potentially life threatening emergencies. The system is much more effective and informative than traditional tornado and civil defense sirens. Please take a minute and click on the CODE RED picture. It will take you to a separate window that will allow you to sign up for the FREE service. Those without Internet access may call the Madison County Emergency Management office (618-692-0537), Monday through Friday, (8:30AM-4:30PM) to register over the phone. The Godfrey Fire Protection District conducts annual business inspections for the Village of Godfrey (a separate government entity) in accordance with the 2012 edition of the ICC International Fire Code, International Building Code, and local ordinances adopted by the Village. Our firefighters inspect every business in the district to ensure the safety of the public. This program has been in place since 2010 and has dramatically improved fire safety and code compliance. If you are a business owner in Godfrey please take a look at our Inspection Form (link). It has a handy reference section that highlights the major things we look for and provides guidance. If you have questions, please call us. We would be happy to answer any questions or provide further assistance. 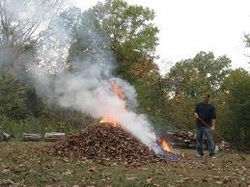 The Village of Godfrey has an ordinance (link) regulating the burning of leaves and other landscape waste. Godfrey Fire District is often called to extinguish fires set by residents that are not familiar with the ordinance. If you live within the Village of Godfrey, please take a minute and familiarize yourself with the burn regulations. A violation of this ordinance often will result in a citation from the Madison County Sheriff's Office. For your convenience, the entire ordinance can be viewed and printed by clicking on the picture.